Three foundations have announced their intention to join in a "mobile health" effort to use mobile technology to provide better healthcare worldwide. The UN, Vodafone, and the Rockefeller Foundation's mHealth Alliance aims to unite existing projects to improve healthcare using mobile technology. 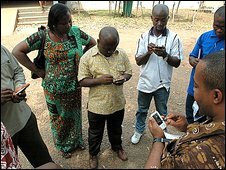 The alliance will guide governments, NGOs, and mobile firms on how they can save lives in the developing world. The partnership is now calling for more members to help in mHealth initiatives. The groundbreaking "mHealth for Development" study produced by the UN/Vodafone Foundation Partnership lists more than 50 mHealth programmes from around the world, showing the benefits that mobile technology can bring to healthcare provision. The report also outlines how such programmes offer value to the mobile industry. That, said UN/Vodafone Foundation Partnership head Claire Thwaites, is a crucial step in an industry that like so many others stands at the edge of a downturn. "I think there's a real need to have an alliance," Ms Thwaites told the BBC at the Mobile World Congress (MWC) in Barcelona. "It's looking at scaling up and bringing governments together with NGOs and corporations, and it will commission pretty rigorous research on what the market opportunity is for mHealth, answering the question: why should a business get involved in this area?" Bringing a "value proposition" to network operators is what could bring together the individual, small-scale efforts that so far have existed as purely humanitarian endeavours. Andrew Gilbert, European president of Qualcomm, says that his firm has launched 29 different programmes across 19 countries, involving some 200,000 people, as part of its Wireless Reach campaign. "It's not a charitable thing, it's very much aimed at allowing these solutions to become self-sustaining," he said. Because 3G mobile technology is cheap and easily made widespread, Mr Gilbert added, comparatively small amounts of investment can wreak great change in these so-called emerging markets. "In India, there are 1m people that die each year purely because they can't get access to basic healthcare," said Dan Warren, director of technology for the GSM Association, the umbrella organisation that hosts the MWC. "The converse angle to that is that 80% of doctors live in cities, not serving the broader rural communities where 800 million people live." Simply connecting rural areas with city doctors using mobile broadband would allow the provision of better healthcare to more people, and many of the initiatives to date have focused on that kind of connection. In 2007, the GSMA supported Ericsson in its Gramjyoti project, providing broadband to the remote Indian villages in the southern state of Tamil Nadu. A band of paramedics in a mobile broadband-equipped van visited the villages and were able to cover vast areas, referring many queries back to doctors in major cities. Yet mobile technology, as much as it can multiply the efforts of city-dwelling doctors and bring diagnoses to far-flung villages, cannot make up for some shortfalls. "There's 4 billion mobile phones now in the world, 2.2 billion of those in the developing world," said Ms Thwaites. "Compare that to 305 million PCs and then look at hospital bed numbers: there's 11 million of them in the developing world." As a result, mHealth projects must also be able to provide an ounce of prevention, and the report sheds light on some particularly successful initiatives. In South Africa, the SIMpill project integrated a sensor-equipped medicine bottle with a SIM card, ensuring that healthcare workers were advised if patients were not taking their tuberculosis medicine. The percentages of people keeping up with their medicine rocketed from 22% to 90%. The medium of text message can overcome sociological barriers as well. The Project Masiluleke SMS message campaign provided people with free text messages, with the remainder of the 160 characters used to provide HIV and Aids education. 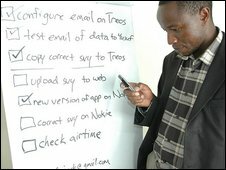 In Uganda, the Text to Change text-based HIV quiz campaign resulted in a 33% increase in calls to an HIV information hotline. "There are a couple of interesting benefits that the project brought to light," says UN Foundation spokesperson Adele Waugaman. "One of them is the benefit of talking to people in their local language. "Also, HIV is very stigmatised in South Africa, so people don't like to discuss it publicly. The benefit of getting these private text messages is it's a new form of access that addresses these stigmatisation and privacy concerns." Healthcare includes improving quality of life as well. One case study from Qualcomm's Wireless Reach programme, - 3G for All Generations - shows how mobile broadband has brought the company together with the Spanish Red Cross and Vodafone Spain to provide a custom software solution for Spain's elderly. They can have video calls with care providers, call for help, or simply have a chat, providing real social interaction without anyone needing to travel. Each of these and the many more in the new report showcases the potential of the technology but underlines the significant stumbling block of mHealth so far. "The biggest problem is fragmentation of small projects," says Ms Thwaites. "A lot of the work being done on the ground is NGO- and foundation-led, but let's join those efforts with the Microsofts and the Qualcomms and the Intels and the Vodafones. "There's a business case for it now; you have to have the experience of the NGOs on the ground talking to the big corporates out there and creating real business models, and that's why I think the mHealth Alliance can tackle that."